Pratiwi, Wiwi (2009) Diskrepansi Diri Pada Perempuan Dewasa Madya (Studi Pada Perempuan Yang Mengalami Perceraian). Skripsi thesis, Universitas Tarumanagara. 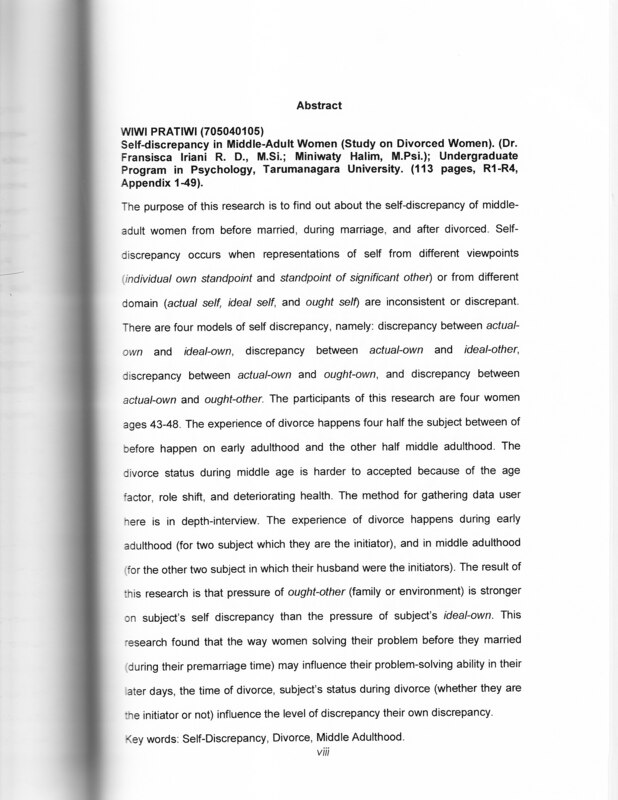 The purpose of this research is to find out about the self-discrepancy of middle­ adult women from before married, during marriage, and after divorced Self- discrepancy occurs when representations of self from different viewpoints (individual own standpoint and standpoint of significant other) or from different domain (actual self, ideal self, and ought self) are inconsistent or discrepant. There are four models of self discrepancy, namely: discrepancy between actual- own and ideal-own, discrepancy between actual-own and ideal-other, discrepancy between actual-own and ought-own, and discrepancy between actual-own and ought-other. The participants of this research are four women ages 43-48. The experience of divorce happens four half the subject between of before happen on early adulthood and the other half middle adulthood. The divorce status during middle age is harder to accepted because of the age f·actor, role shift, and deteriorating health. The method for gathering data user here is in depth-interview. The experience of divorce happens during early adulthood (for two subject which they are the initiator), and in middle adulthood ,for the other two subject in which their husband were the initiators). The result of his research is that pressure of ought-other (family or environment) is stronger on subject's self discrepancy than the pressure of subject's ideal-own. This r·esearch found that the way women solving their problem before they married (during their premarriage time) may influence their problem-solving ability in their later days, the time of divorce, subject's status during divorce (whether they are the initiator or not) influence the level of discrepancy their own discrepancy . Self-Discrepancy , Divorce, Middle Adulthood .